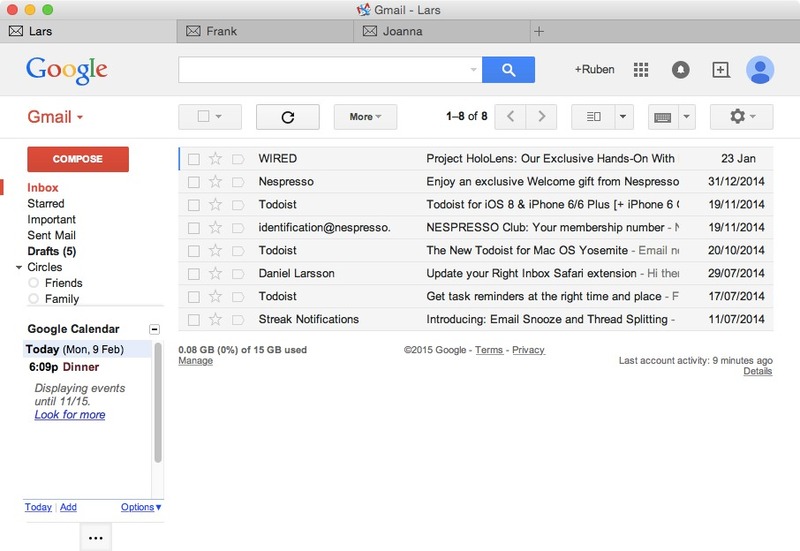 Love Gmail? Mailplane makes it even better. Switch between accounts instantly. No need to sign-out and sign-in. Google Calendar is a perfect match for Gmail. Mailplane combines them in one app. No separate calendar set-up required and accepting an invitation intuitively switches to the correct calendar tab. Mailplane is a native OS X application and integrates naturally into OS X. Apple Mail like keyboard shortcuts, acting as default Mail Client, Mail PDF from Print Dialog, OS X Services, and much more. Enable great Gmail plugins on an account basis with a single click. Hide ads or apply a custom stylesheet. Resize images, compress directories or capture your screen and attach it to your message. No need to start another app. Don’t download attachments twice. Preview them with QuickLook. Mailplane’s notifier tells you everything about unread messages. It integrates with OS X notification center and the ‘Do Not Disturb’ mode allows you to stay focused. Mailplane talks to apps like Safari, iWork suite, iPhoto, Contacts, Evernote, Things, OmniFocus, Alfred, and Lyn. Mailplane has also an AppleScript interface to automate some of your daily workflows. ⌘1, ⌘2, ⌘3, ... opens the main window before switching to the tab if it is closed. Renamed share extension and service menu items (removed '3' from of their label).